Our property is situated so that we have three road frontages. 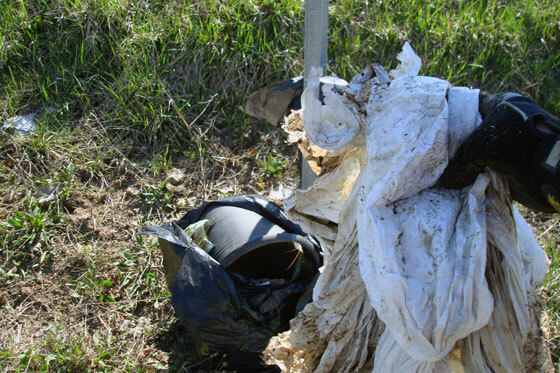 What this means is that we have about 2 kilometres of ditches that to passing drivers apparently look like one large trash can. 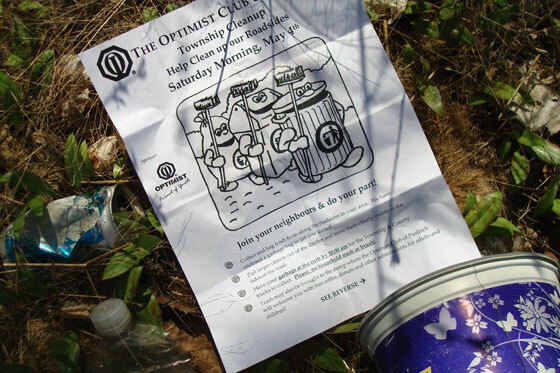 A recent notice in the mailbox for a community clean up was the motivation I needed to pick up after all of these litter bugs. The saddest thing about this photo is that I didn’t stage it. I simply set the notice down amongst the trash. Outfitted with my rubber boots, work gloves and multiple garbage bags, I headed out. I had two bags on the go at a time, one for recycling (mainly cans and bottles) and one for garbage. I could have probably separated the garbage a bit more, but two bags was about all I could wrangle. 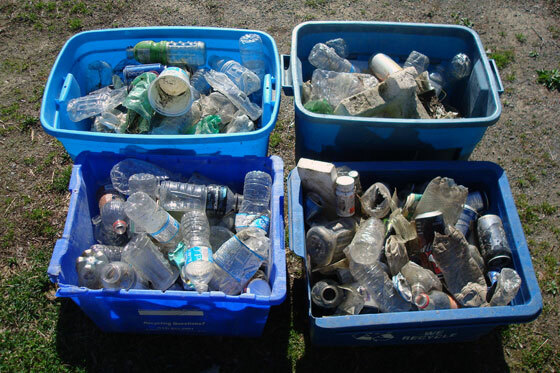 The most common finds were takeout coffee cups, plastic water bottles and cigarette packs. There was lots and lots of plastic. 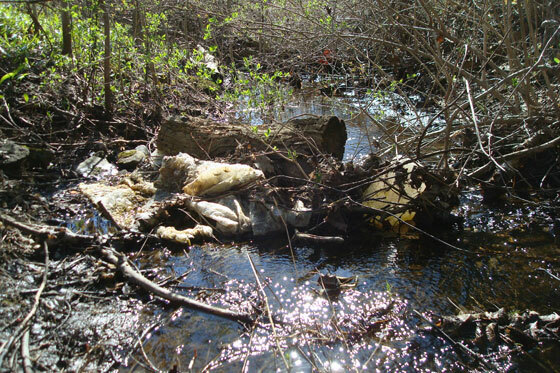 We have a creek that runs along the front of the property, and while it is set farther away from the road, it was still full of trash as well. These particular pieces of plastic turned out to be a very big sheet of bubble wrap and a large jug which had formed a dam. Some of the more unique finds included a shoe, two gloves (not a pair) and the remains of a wine glass. Sometimes, I wasn’t sure what things were right away. 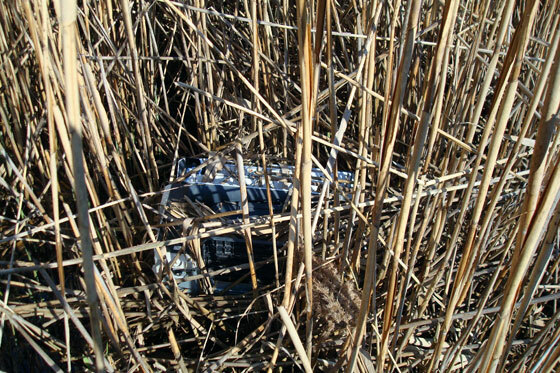 As when I first spotted this item a few feet back in the reeds along the west side of the property. It turned out to be a small photocopier. Yup. 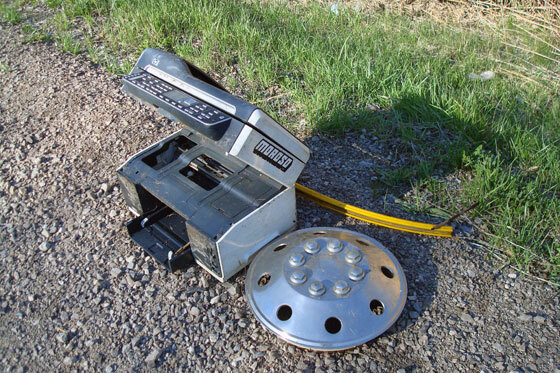 Someone went to the effort to carry a photocopier out of their office, put it into their car, drive it to our property, pick it up out of the car, carry it across the ditch and heave it into the marsh. They didn’t even just open the car door and push it out. They put work and planning into this–I know, because I climbed into the marsh and dragged it out and it was heavy and awkward. Fortunately, I was able to leave the photocopier, other large items and even the full bags of garbage on the shoulder and our amazing garbage men took them away on our regular pick up day. The recycling I carried home and dumped into our bins. Some people were encouraging–one driver honked and gave me a thumbs up as he drove by and another pulled over to say how great it was that I was cleaning up. However, I probably was not as gracious as I could have been to them as I spent most of the clean up being royally ticked off. Who finishes their coffee and decides the correct action is to roll down the window and pitch the cup into the ditch? My irritation went to another level when Matt and I went out and passing by two of the garbage bags I’d left on the side of the road I saw that someone had pitched a Blizzard cup and two plastic spoons onto the shoulder–and they’d obviously aimed to get them right beside my bags. Who is that rude? Fortunately, our garbage men are incredibly considerate, because not only did they pick up all of the trash bags and larger items I’d left on the side of the road, they also picked up the cup and spoons. 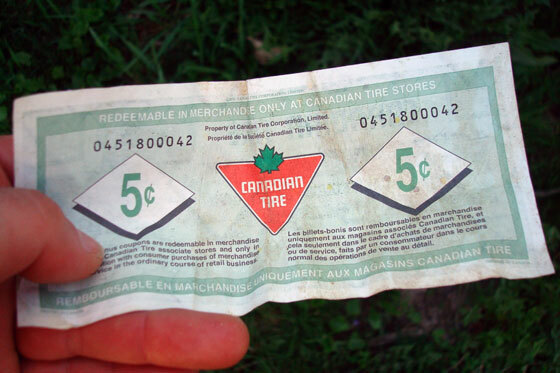 Out of the whole clean up, I only found one item worth keeping. You better believe I tucked that 5 cents into my pocket and brought it home with me. I need some new work gloves! Good for you. As if you don’t have enough work to do in your life. Now you are picking up after horrible slobs. Who are these people? Great piece. Why don’t you submit it to a newspaper? Beautiful wedding on Saturday. Lovely venue, lovely bride and attendants, and a very funny master of ceremonies. Well done all. Thanks for the suggestion. I just might do that. And I agree, the wedding was great. It is so sad that you had to spend so much time picking up after lazy people, but good for you for doing it! 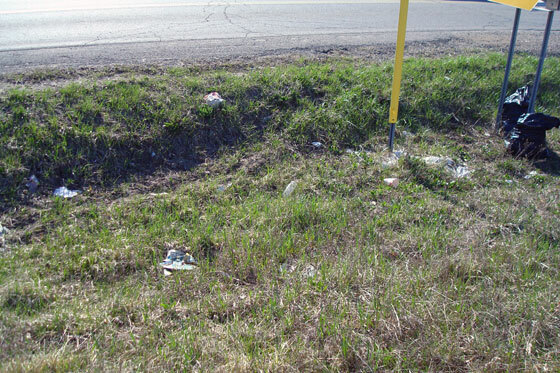 I used to live right on a two-lane highway and when I mowed my ditch I had to clean up all kinds of crap from people. I can’t even throw so much as a straw wrapper out of my window, I just won’t litter, it’s not right. I can’t imagine what you had to deal with living on the side of a highway. Our roads are busy by country standards, but they’re still country roads. Could you post signs along your property? And I agree with Auntie Anne that this post would make a good submission to a local paper. It’s hard to believe how much people litter. I think it’s a lot worse in the country than the city, actually. Who would have thunk it? My daughter went into environmental studies after high school. I said I was surprised at her choice, and she said I was the one who taught her about caring for the environment. She said she was the only one of her friends who, when anyone so much as spit their gum out the car window, I would screech to a halt along the side of the highway and make the offender go back to get it, along with subjecting all three of them to a lecture about “when I was in girl guides, we had to leave our campsites cleaner than we found them…” I had forgotten I did any of this, but I guess it made an impact! What a wonderful influence you had on your daughter. I’ve considered signs. I’m not sure how effective they’d be because everyone knows not to litter, but obviously people do it anyways. In the country, I think it might be a case of ownership not being clear. People see woods, ditch, field but not lawn. My theory is they think no one will notice and it really doesn’t matter if they toss their coffee cup out the window.